Ben Wallis: husband, new father, and salesman. I work for eShipping, a logistics technology company in the role of Business Development Manager. We work with companies in the area of transportation. 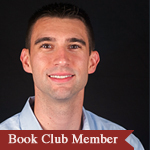 WHY DID THE ACTIONABLE BOOK CLUB RESONATE WITH YOU? I am always interested in personal growth and becoming “more” each day. My goal for 2013 was to develop a more systematic way to read, review, and create action steps from all the mounds of information that exists out there. When this opportunity came along, I knew I had to be a part! I’m excited to be a part of this group!